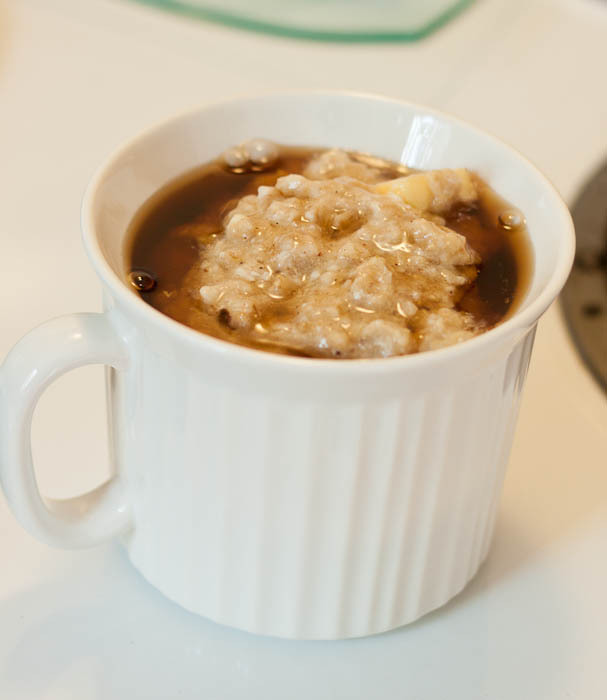 This has become a regular for me and there are so many ways you can make oats and egg whites. When I mentioned this breakfast option to a group of ladies, I got kind of a cross-eyed look. Don’t worry, I thought the SAME thing when I first saw Katherine make a similar recipe. I got this recipe from Jen Grothe’s blog, here is the original post. The egg whites make the oats fluff up into kind of a souffle type texture. On top of the added bulk to this breakfast, you get a good dose of protein too! In the photo (above) I already had mixed in the apples, don’t worry, they are in there 🙂 Here is Jen’s recipe, just cut and paste. Heat water to boiling in a small pan. Add a dash of sea salt if desired. I always do. I’ve learned that a little salt is actually good for my thyroid, so I salt away. When boiling, add oats. Stir, reduce heat, and cook until softened (around 3-5 minutes). Add egg whites, maple extract, and seasonings. Continue to cook over medium, stirring often, until eggs literally bake “up”. Before serving, cut in apples. Sprinkle again with cinnamon and serve with Walden Farms maple syrup. I use the Sugar Free from Maple Grove Farms and LOVE it and I generally dislike the taste of sugar free stuff.